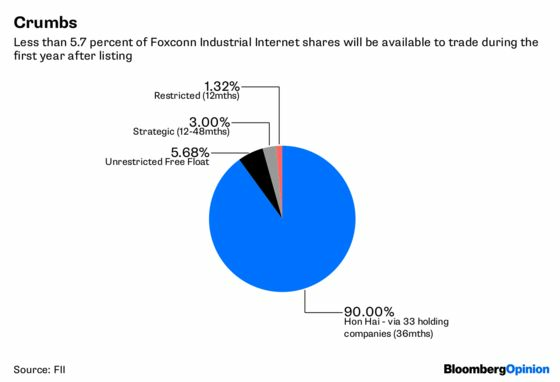 (Bloomberg Opinion) -- By now, you’ve probably heard about the blockbuster IPO of Terry Gou’s Foxconn Industrial Internet Co.
Good luck getting your hands on the shares. Gliding through regulatory red tape like a hot knife through butter, FII’s Shanghai listing has caught a lot of attention, and money. The not-so-high-tech arm of Foxconn Technology Group is raising 27.1 billion yuan ($4.3 billion) by selling the bare minimum 10 percent of its stock for trade on the Shanghai Stock Exchange. That means 90 percent stays under the control of Taipei-listed Hon Hai Precision Industry Co. via 33 different affiliates – overkill, Terry, overkill – and can’t be traded for 36 months. Of the 10 percent being sold, though, 3 percent was doled out to a who’s who of Beijing favorites with lockups of one to four years. A further 1.3 percent is restricted from trading for 12 months. That leaves just 5.6759 percent of shares available to trade freely. 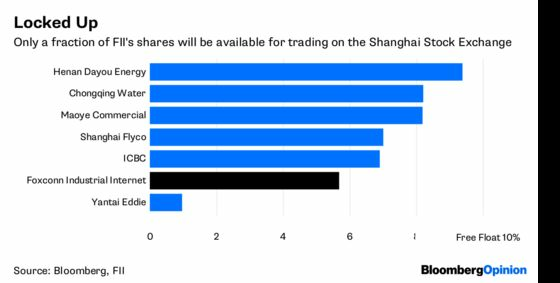 Only one other company on the Shanghai exchange has a smaller free float – Yantai Eddie Precision Machinery Co., which listed last year and has annual revenue of just $94 million, according to data compiled by Bloomberg. Even after 12 months, the FII float will rise to only 8.06 percent, less than all but three of the almost 1,500 stocks listed in Shanghai. FII’s offering, the largest in China since 2015, has been labeled a marquee IPO and part of Beijing’s efforts to court an unrepresented sector. By keeping supply tight, Foxconn and the Chinese government get their listing while maximizing the chances that hot demand will drive up the price. That’s a win-win situation, except for the average punter.